The ideal situation for therapy is to have three Shelter Therapy Houses. These basic colors are blue, red, and yellow. There are six colored Shelter Therapy houses in all. These colors are again blue, red, yellow, and we now add black, grey, and white. Additional house colors can be custom ordered, as well as the basic six colors available above. Each color represents something to the unconscious, subconscious, and conscious mind. The theory behind this is that when blue is juxtaposed with red and yellow ancient man saw this as a marriage, or rivalry symbol connection, between heaven (sky) and earth. This can also be construed as the rival between the id and the super ego. The legend of Genghis Khan of the Mongolian Dynasty is said that he was to be born of a blue wolf and a yellow doe. Obviously, due to his history of war he was considered to be the “red” in this color combination. Here you see the blue, yellow, and red pattern again. 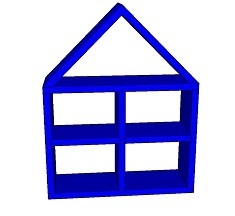 It is possible to start out with the blue Shelter Therapy House as a starter house and add the other colored Shelter Therapy Houses later on for your therapist collection. Blue is the basis of all colors and basic blue can be manipulated into a joy based (positive), or fear based (negative) emotion. It is possible to start out with the blue Shelter Therapy House as a starter house and add on later to your personal collection. Blue is the deepest of all colors. It is the color of dreams and eternity, and truth. It can also symbolize emptiness, starvation, and death. Light Blue can mean loyalty, peace, calmness, or sincerity. Dark Blue can mean depression, sadness, loneliness, and despair. Medium blue is used for the blue Shelter Therapy House as it can represent all types of “blue feelings”. 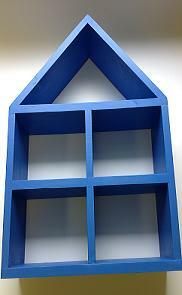 You can also have your Shelter Therapy House customized with a lighter, or darker navy blue. *Note: One can be more productive in a blue room (or house) making therapy more productive.